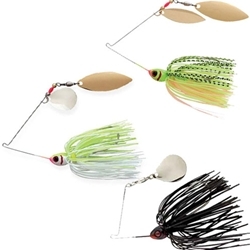 The Booyah Blade Spinnerbait color for color and component for component, are the finest spinnerbaits available at any price. They come equipped with Flex wire alloy frames for maximum vibration, Hard coat paint for 3D eyes and flared gills, and have Mustad Ultra Point premium round bend hooks. We offer them in a 3/8oz and 1/2oz with the follow blade combinations: Single Colorado, Colorado/Willow,and Double Willow. Please Note: the color of the blade for a specific color is listed after the blade combination. Ex. N/G = Nickel/Gold,G/G = Gold/Gold.